Let’s talk about the one thing all mothers miss the most once they have children: sleep. Once you have kids (and let’s be honest, even before they are actually born) your chance to sleep through the night is almost zero for the foreseeable future. 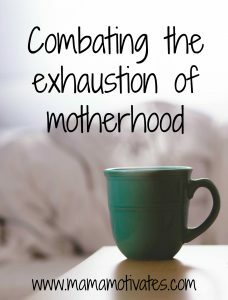 There are several things you can do on any given day to combat the bone-tired exhaustion moms experience in the early days (and years) of motherhood. Giving your body extra water will help increase your energy (and is just plain good for you). And if you drink your water cold, it will help wake you up. If you don’t like drinking plain water, add some fruit to your water or drink carbonated water. The idea is to get the hydration, however that needs to happen. Just make sure you aren’t choosing those sweeteners that come with added sugars. It may seem counterintuitive, but exercising actually gives you more energy. Even if you are totally wiped out right after your workout, exercising in general increases your energy throughout the day. If all else fails, just guzzle coffee (or your caffeine vehicle of choice). Sometimes the extra boost, as temporary as it is, is what you need to get through the day. But make sure you are eating throughout the day as well. Letting your blood sugar get low will exacerbate your fatigue. Motherhood is tiring. We all know this. But there are things we can do to quickly boost our energy to help us get through the day. What is your favorite way to get more energy? How do you take your coffee?